The annual summer music festival season has just expanded again. 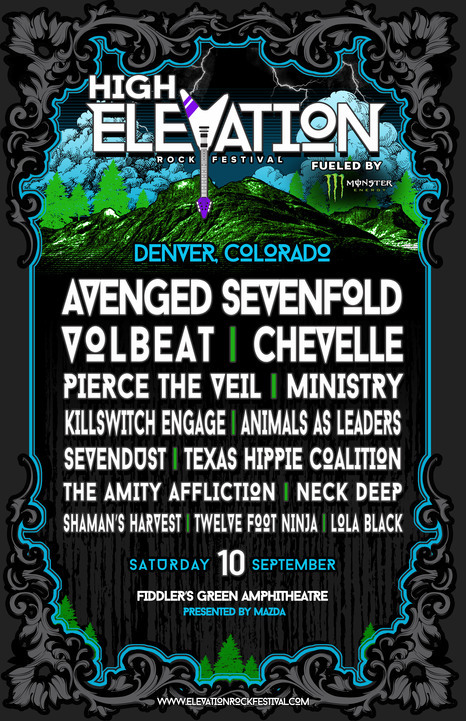 The High Elevation Rock Festival will make its debut this summer. It will be held Saturday, September 10th at Fiddler’s Green Amphitheatre in in Greenwood Village, Colorado. That is just outside Denver. The one-day festival will feature some of today’s biggest rock acts over the span of eleven hours. 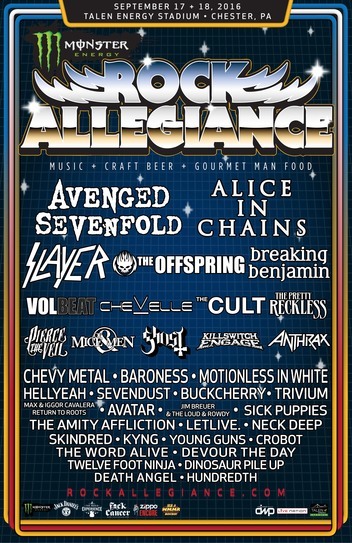 Those bands include but are not limited to: Avenged Sevenfold, Volbeat, Chevelle, Pierce The Veil, Ministry, Killswitch Engage, Animals As Leaders, Sevendust, Texas Hippie Coalition, The Amity Affliction, Neck Deep, Shaman’s Harvest, Twelve Foot Ninja, and Lola Black. Pre-sale tickets for this event go on sale this Wednesday, May 18th at 10:00am MDT/12:00pm EDT and ends Friday, May 20th at 9:59am MDT/11:59am EDT. They can be purchased online at http://www.HighElevationFestival.com. Audiences can go online to the festival’s Facebook, Twitter, and Instagram page to obtain a password that can be used to purchase said tickets. Public on-sale for tickets begins Friday, May 20th at 10am MDT/12pm EDT. General Admission ticket prices are noted below. A very limited number of General Admission lawn 4-packs will be available for $198 each. There will also be a limited number of tickets available for active military personnel online through a partnership with GovX. They can be purchased online at http://ww.govx.com. A limited number of hotel packages for 2 and four people each will also be available for purchase. Hotel packages include: accommodations close to the festival site, premiere parking, and festival shirts for each person attending. The organizers of the annual Welcome to Rockville festival have announced the complete schedule for this year’s festival, including performance times for each act on the bill. Digital Summer and World Gone kick off this year’s festival. Digital Summer and World Gone are schedule to open the festival at 11:15am on the Monster Energy Fire Museum Stage and Jagermeister Stage respectively. Cathercist, winner of the Ernie Ball Battle of the Bands, is up next at 11:45am ET on the Ernie Ball Stage. Within Reason and Ghost of War will open the festival’s second day at noon on the Monster Energy Fire Museum Stage and Jagermeister Stage respectively. The complete performance schedule for the weekend’s events is included below. Before the bands take to their respective stages, audiences will be treated to Monster Energy’s Welcome to Rockville Official Pre-Party Friday, April 25th. 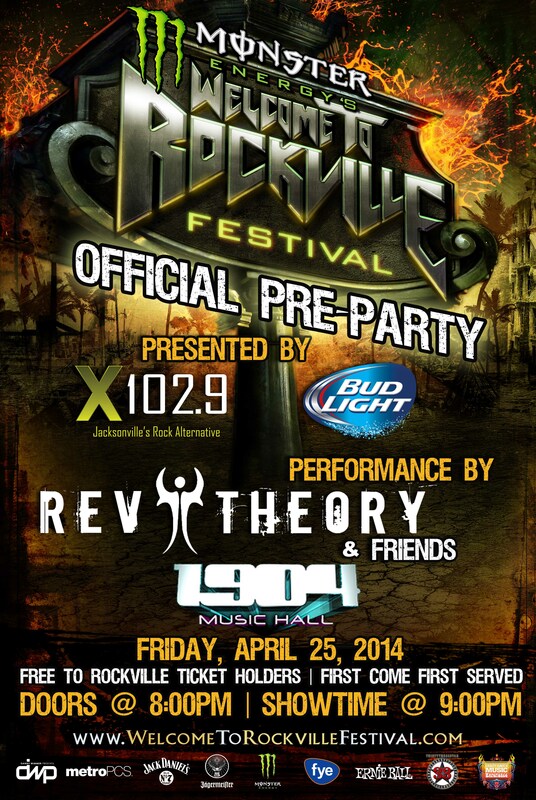 The Pre-Party is presented by X102.9 and Bud Light and will feature performances by Rev Theory and more. It will be held at 1904 Music Hall (19 N. Ocean Street in downtown Jacksonville, FL). It is free to ticketholders that are 21 and older. Ticketholders that want to attend the Pre-Party must show their festival tickets at 1904 Music Hall to get a Pre-Party wristband in advance. Wristbands are in limited quality. So they will be first come first serve beginning at 12pm ET on Friday, April 25th. Doors open at 8pm. The show will start at 9pm. More information on the fourth annual Welcome to Rockville Festival is available online at http://www.WelcomeToRockvilleFestival.com, http://www.facebook.com/welcometorockville, and via Twitter at @RockvilleFest. To keep up with the latest sports and entertainment news and reviews, go online to http://www.facebook.com/philspicks and “Like” it. Fans can always keep up with the latest sports and entertainment news and reviews in the Phil’s Picks blog at https://philspicks.wordpress.com. 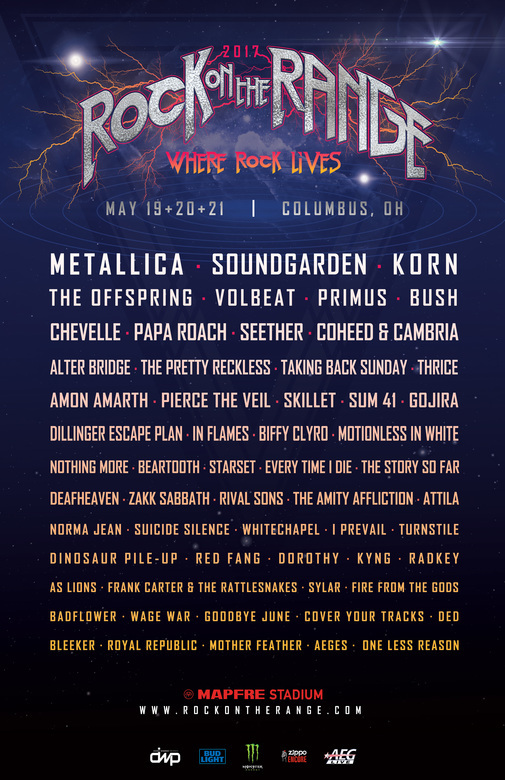 The organizers of the Carolina Rebellion Festival have announced a change to the weekend of the annual concert festival. It has been announced that Motorhead will no longer be on the lineup for this year’s festival. 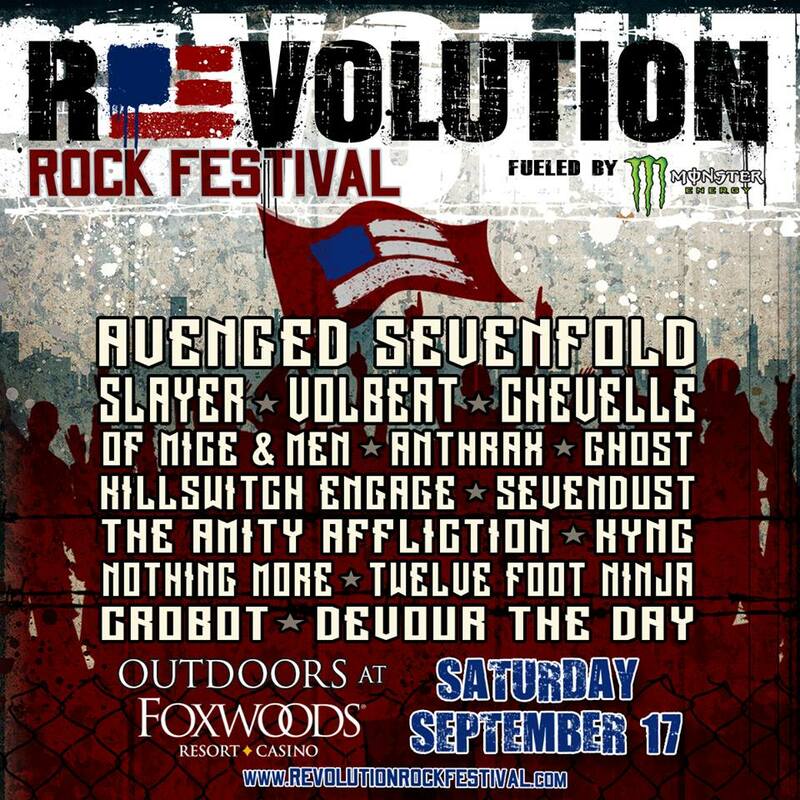 The Carolina Rebellion Festival is the mid-Atlantic region’s biggest annual rock festival. It will return to Charlotte Motor Speedway in Concord, NC May 3rd and 4th, 2014. The current band lineup for this year’s edition of the Carolina Rebellion Festival is listed below. Bands announced for the festival will perform on one of three separate stages throughout the Charlotte Motor Speedway. 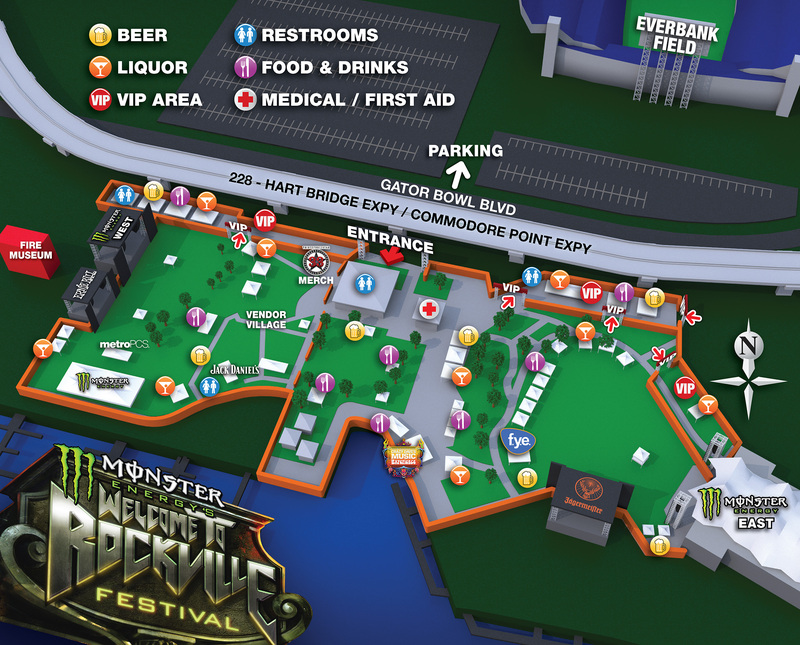 Those stages are the: Carolina Stage, Rebellion Stage, and Jagermeister Stage. Tickets for the 2014 edition of the Carolina Rebellion Festival are on sale now. This includes Camping, Hotel, VIP Packages, and Weekend 4-packs and upgrades. All camping and hotel packages include access to the Friday Night Campground Party. Active military members can purchase tickets once again at a discount. More information for all ticketing, including military discounts, is available online at http://www.CarolinaRebellion.com. The Carolina Rebellion Festival was created in partnership by AEG Live and Danny Wimmer Presents. It is sponsored by Monster Energy, Jagermeister, Ernie Ball, Jack Daniels, Bud Light, F.Y.E. and Pabst Blue Ribbon. More information on the Carolina Rebellion Festival is available online at http://www.CarolinaRebellion.com and http://www.facebook.com/carolinarebellion. To keep up with the latest sports and entertainment news and reviews, go online to http://www.facebook.com/philspicks and “Like” it. Fans can always keep up with the latest sports and entertainment news and reviews in the Phil’s Picks blog at https://philspicks.wordpress.com.